An electronic signature (eSignature) is an digital equivalent of a paper signature and is legally valid for many forms and agreements like US federal and state tax returns, now Adobe has came up with a new free online PDF signing service dubbed ADOBE eSIGNATURES allowing users to sign PDF documents online for free. 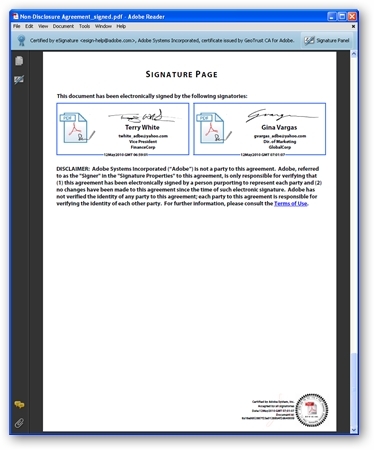 Documents signed using eSignatures are certified by Adobe to ensure that no one has modified them. When opening a electronically-signed document in Adobe Reader or Adobe Acrobat Professional it will show a blue ribbon to indicate that the PDF file has not been modified.